A study in the latest issue of the journal SLEEP provides further evidence that sleep apnea should never be left untreated. Older adults have twice the death risk when excessive daytime sleepiness is paired with obstructive sleep apnea. The study involved 289 participants at least 65 years old and with no clear signs of dementia or depression. The average age at the start of the study was about 78 years old. About three-quarters of the patients were female. An overnight sleep study at the beginning of the study was used to diagnose participants with obstructive sleep apnea. Subjects who indicated that they felt sleepy or struggled to stay awake during the daytime at least three to four times a week had excessive daytime sleepiness. Social security death index records indicate after 14 years nearly 55 percent of the participants died. Results show that participants with excessive daytime sleepiness combined with sleep apnea were more than twice as likely to have died. Being sleepy in and of itself did not lead to an increased mortality risk. The lead author of the study says it’s still unclear exactly why sleep apnea and excessive daytime sleepiness increase the risk of death in older adults, but he suspects it may be related to inflammation. Cases of inflammation may increase the risk of other medical problems such as hypertension. 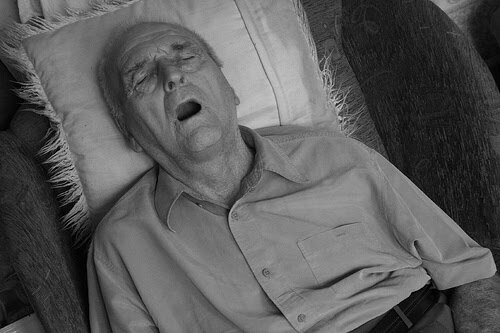 Obstructive sleep apnea affects nearly 20 percent of older adults. It occurs when the soft tissue in the back of the throat collapses and blocks the upper airway during sleep, causing pauses in breathing. The study was unable to demonstrate whether treatment for sleep apnea reduced the risk of death. The Sleep Education Blog strongly recommends that anyone with moderate to severe sleep apnea seek treatment immediately. CPAP therapy is the first-line treatment for obstructive sleep apnea, especially in more severe cases. Surgery and oral appliance therapy are also effective options for lesser cases. If you think you may have sleep apnea, get checked out at one of the more than 2,200 AASM-accredited sleep disorders centers in the United States. Go to http://www.sleepcenters.org/ to find a sleep center near you.